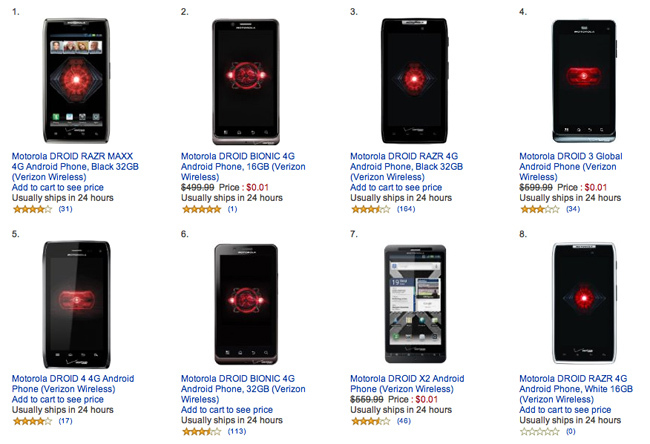 Not to be outdone by Sprint’s Amazon sale today, all of the Motorola DROID phones are on sale, some even going down to the low low price of $.01. For new activations, you can get the DROID RAZR MAXX for $149.99 and the original RAZR for $49.99, both packing 32GB of internal storage. If a keyboard is more your thing, the DROID 4 is also $49.99 but if you don’t want the 4G the DROID 3 is only one cent. We thought it stopped there but upon further inspection it seems that Verizon’s whole 4G lineup is on a discount. The Galaxy Nexus is up for $99.99, HTC Rezound for $79.99 and the LG Spectrum is only $59.99. Better head over to Amazon quick if you are looking to add another line. These deals are pretty good.